There are two reasons to be excited for upcoming indie dungeon crawler Barony. The first is its description. On the game's TIGsource thread , creator Sheridan Kane Rathbunhe explains that it's essentially "Ultima Underworld, with multiplayer and lots of rogue-like stuff." The second reason is the trailer's use of In The Hall of the Mountain King, which is, in and of itself, a naturally exciting piece of music. Although it could have been made more exciting had the maker just learned a few lessons from AAA trailer making. Namely, dubstep . 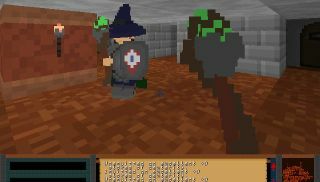 "Barony is a new, 3D, first-person RPG featuring cooperative multiplayer, dungeon-crawling, rogue-like elements, and real-time action," explains the description underneath the real, non-dubstep trailer. "It is being developed primarily by a guy with too much time on his hands, with some assistance from two other guys with too much time on their hands." While the game will be randomly generated, its creator hopes to retain the authored feel by creating "prefabs" - hand-made level parts that can be slotted together by the level creation equation. These level bits are also completely modifiable, thanks to an editor that will bundled with the game. You can learn more about Barony, which is currently in the closed alpha phase of development, by visiting the game's website .